First Line: The slow-burgeoning morning was soft grey with mist, the light not yet light and the stillness an enchantment cast over the marshes as far as the eye could see. Pretty young Alice is taking care of her orphaned brother Frankie while working as housekeeper to a wealthy widower, Mr. Hemmings. Mr. Hemmings lives out on the Cambridgeshire fens, and Frankie has become adept at fishing for eels; it brings in extra money. Alice is being courted by Monroe, Hemmings' gamekeeper, but she's keeping her options open. Monroe has a reputation for being unreliable, and-- sure enough-- shortly before Christmas Monroe goes missing. But as Christmas day draws closer, strange things begin stirring out on the frozen marsh, and inexplicable occurrences frighten Alice and Frankie. 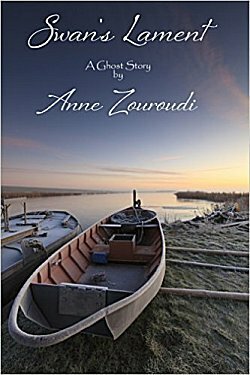 I have to admit that I've always been a fan of a well-told ghost story, whether in print or on film, and Anne Zouroudi's "Swan's Lament" is a very good one. The lean times of the early 1950s come to life as Frankie puts newspaper in his too-large shoes for warmth and a better fit. I also don't think there's anywhere quite as atmospheric as the fens (marshes) in England: the chill, the damp, the fog that can either make things impossible to see... or make you see things that aren't really there. There are all sorts of hidden desires weaving their way around Alice, Monroe and Hemmings, and what the oblivious young Frankie doesn't realize becomes all the clearer to readers. Zouroudi expertly crafts an ever-building feeling of dread, and the scene with Frankie out in the punt genuinely frightened me. You might just agree that there's something about wet footprints leading to doors... but not going away... that can make the hair stand on the back of your neck. This is a wonderfully creepy little story that I enjoyed every minute of. If you enjoy ghost stories, too, I advise you not to miss it! Ooh, interesting! I've read her Hermes Diaktoros novels (well, some) but not this one. Thanks, Cathy. I'm not usually one for ghost stories or the paranormal. But a good story is a good story. Well, I'm not one for ghost stories. Only one by Asa Larsson made my hit parade. However, what caught my eye is the beautiful cover here. One wants to know why the boat is empty and what the story is here. Well, there's the mystery right there, and the empty boat just tantalizes us.